A little white kitten is curled up in a basket. Eating and sleeping are two of their favorite things. 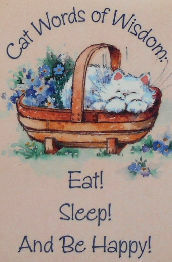 This cat magnet is 2 1/8" wide x 3 1/8" high. Previously owned but in good condition.